This week I experienced a Ponce de Leon moment at the Fill. Ponce de Leon, you may recall, was the Spanish conquistador who, legend has it, went looking for the Fountain of Youth and found Florida instead. Not being satisfied with having discovered a new continent, Ponce de Leon searched all up and down both coasts of Florida for the Fountain of Youth, enduring heat, humidity, the flies, and mosquitoes. I can easily imagine him marching along in his metal helmet and breastplate, wishing someone would invent air conditioning. It is, perhaps, this bird’s very plainness that has attracted me. Hutton’s Vireos are creatures as full of life as the gaudiest bird on the planet, yet they have some of the dowdiest plumage. I like the contrast. Unfortunately, Hutton’s Vireos do not belong at the Fill. “The habitat is just not right,” one expert told me, “so searching for them here is pointless.” It’s all too true. Hutton’s Vireos are fairly common in western Washington, but they prefer forests. There is no forest habitat at the Fill — just marsh, prairie, ponds, swamp, and gardens. Hutton’s don’t travel around much, either. They are year-round residents who tend to stay put once they establish a territory. However, some do spread to non-breeding areas in the fall, and why not to the Fill? I have long wished to see one here. This past Tuesday, I got my wish. I was sitting on my camp stool in front of a small grove of alders and cottonwoods, watching a gigantic flock of Bushtits forage from bush to branch to grass stem. Among them were Black-throated Gray Warblers, Wilson’s Warblers, Western Tanagers, and other migrating songbirds. I was trying to put my binoculars onto every twitching leaf before “warbler neck” set in and incapacitated me, when behind one leaf halfway up an alder emerged the vireo. I stopped breathing as this little guy slowly worked its way along a branch, captured a bug, ate it, then wiped its bill clean on the branch. It was in plain view for perhaps three seconds. Twenty-five years of searching, and here was my reward at last. Three seconds became an eternity as I watched. Rare magic. 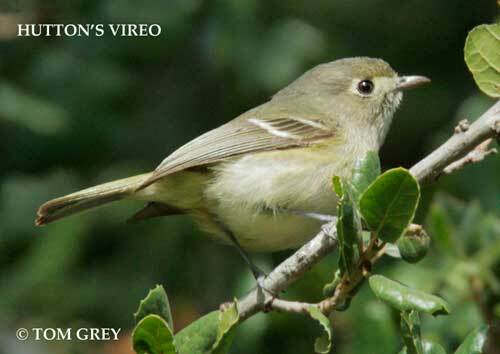 Who needs that silly Fountain of Youth when you can find a treasure like a Hutton’s Vireo? Best of all, my treasure was real. This entry was posted in Uncategorized on September 22, 2011 by constancesidles.